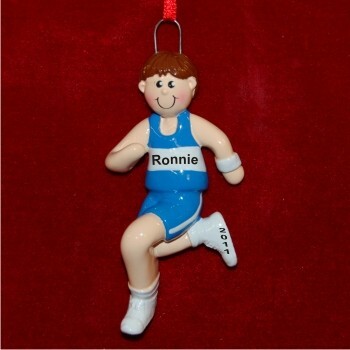 With an athletic design that looks very realistic, the male brunette running personalized Christmas ornament is ideal for youngsters keeping fit by participating in track, cross country or local road races. This will be a special keepsake of his athletic pursuits when our lettering artists add his name and the year using a very handsome font. These sports ornaments personalized from Russell Rhodes include an attractive cord that makes them easy to display on the tree or on his backpack as a charm. Encourage him on to faster times and greater success with the male runner brown hair personalized Christmas ornament in our plush velvet gift bag.